Crossroads Church is a nationwide church with 10 physical buildings in two states and people meeting in rented buildings, homes and co­ffee shops all across the country. Our largest room that we broadcast from has about 3500 seats and our other campuses range from 100 seats up to 2500. 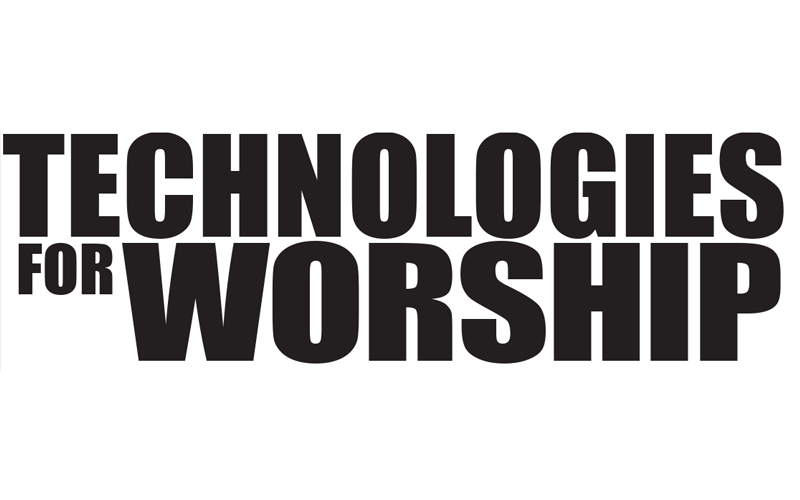 Our worship style is modern; we are seeker sensitive – we start every weekend planning for new visitors, we try to o­ffer something di­fferent to open-up a dialogue to get people thinking about God in a di­fferent way. Our broadcast is very important to us. It is critical to our weekend operations that the message we capture and distribute to Crossroads sites is excellent. In the past year we reached the point where more people hear the message over video at a remote site or online than experience it live. 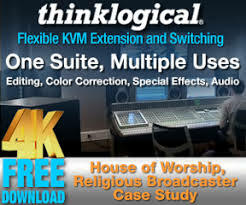 With that in mind and feeling God call us to a nationwide presence; we recently invested $2 million in our control room to ensure that our webstream and all the di­fferent ‑les and packages we produce for campuses are the absolute best they can be. We upgraded from three 720p cameras to eight 1080 cameras, installed a 6 M/E Ross Acuity and a 180×180 Evertz router. During weekends we have two technical directors calling cameras; one for our online Crossroads Anywhere experience and one for our Oakley campus and traditional multi-site feeds. Have the right people using the right equipment is absolutely necessary for us to achieve our missions of connecting seekers to a community of growing Christ-followers. We do a huge production for Superbowl weekend – traditionally, one of the least attended weekends for churches. So we decided to go all out for Superbowl to get people in the church. We have a huge football themed service, we do a halftime show, fun commercials, tailgating, and you name it. A couple of years ago, one of our musicians built a ‘Blue Man Group’ style PVC backpack rig that could be played with drumsticks, and we lighted and mic’ed it, and also wanted to put cameras on it. To do this, we bought Marshall Electronics CV-500- MB2 cams to provide these great overhead shots. We were really happy with the image quality, and it opened up creative opportunities for micro-cameras at all our facilities. Our initial purchase was nine cameras (three or four of the rigs for every campus doing that drum piece), and now we have twelve. 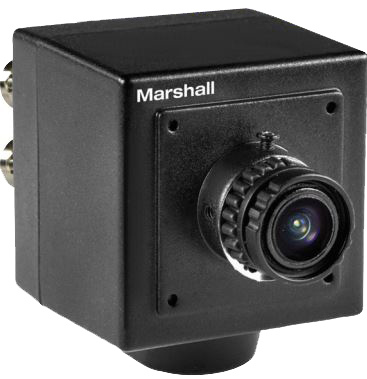 The Marshall Electronics cameras have enabled us to get shots we normally wouldn’t be able to get, at an affordable price. We can put the micro-cameras right next to a drum kit, or on a keyboard, without having to worry about putting an actual camera operator on stage and taking up space. 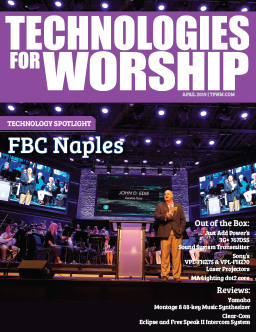 The cameras are so small, and the images so immediate, that we are able to bring the audience in closer to the worship leader without causing a lot of distractions. ­The cameras are native HD-SDI, so they drop right into our systems. We can connect them right to our switchers without having to worry about conversion, which would add unwanted latency. If we were to use a GoPro, with the conversions that we would have to do, we would have noticeable latency, which is why these cameras are so good. ­They are super easy to work with – we’ve made long SDI and power cables for ourselves that allow us to put the power supply for the camera o‑ stage, which means a much cleaner stage, less of a tripping hazard. The interchangeable lenses are a great tool as well – we can change the lens as needed. We were able to put a really long lens on one of the cameras that we were able to hang from the catwalk to do close-up of an artist drawing on stage. We can use the cameras on a mic stand in the back of a room to get a wide shot from the back of the auditorium to send back to a control room for confidence monitoring. When we’ve had to bring different guests in over Skype and Google Hangout, and we were able to put the camera in the control room and send the video to our speakers and talk to them. We can literally put the cameras anywhere and just get some fantastic shots, only limited by your imagination. The cameras can’t be used as your main camera, of course, but for secondary fun shots, close-ups, and quick options to cut away to in a live situation— they are absolutely amazing for that. 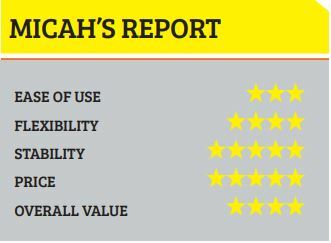 Overall the CV-500-MB2 was the right product for us at the right time. They enable our locations with fewer cameras to have more options at an amazing cost. ­The image is good most of the time and excellent when there is plenty of light on stage. ­Their versatility and flexible mounting options help us keep things fresh and changing. The cameras are a solid, reliable tool in the tool belt of live video production. MICAH DRUSHAL IS AN AV TECHNICIAN ON CROSSROADS’ CENTRAL AV INFRASTRUCTURE AND INNOVATION TEAM. WHEN HE’S NOT IN A CONTROL ROOM OR ON A CATWALK, HE LIKES TO SPEND TIME WITH HIS WIFE AND THEIR MINIATURE BEAGLE, DIXIE.